The National Weather Service in Honolulu has issued a high surf advisory for the Kona Coast of Hawaii Island until 6 p.m. this evening. 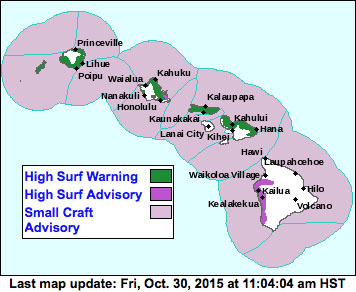 Surf is forecast to be in the 6-10 foot range along the West facing shores of Hawaii Island. A small craft advisory is in effect until 6 p.m. this evening for all Hawaiian waters except Maalaea Bay.